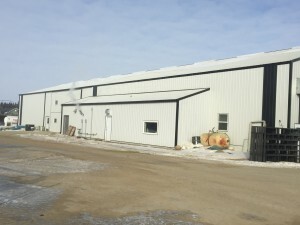 Located in Notre Dame, Manitoba this project is a 60′ x 80′ x 18′ wood stud frame addition to an existing building. The addition is fully insulated and lined with metal liner panel as well as a concrete floor with in floor heat. The addition also has a 28′ wide x 16′ insulated bi-fold door installed on the side wall and a large opening into the existing shop.